When I talk to other players about character appearances, it often seems to me that I care a lot less about what my characters look like than the average player... yet at the same time, also a lot more. I care less in the sense that I don't really give a fig about whatever's supposed to be the newest, coolest set of gear from the Cartel Market. Most of my characters only own a single outfit, which they've often worn since they were lowbies. And what's that about some detail about the newest hairstyle that you don't like? Eh. 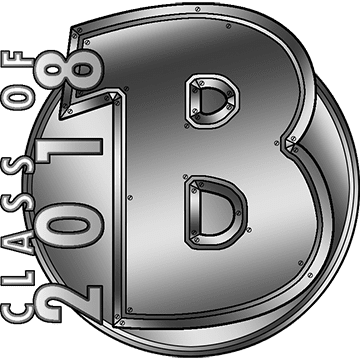 However, I seem to care more than average in the sense that I consider my characters' looks an essential part of their personality and rarely - if ever - change them. I think I can still recall every single time I've ever taken a character to the barber shop to change their appearance after creation (in any MMO) - it hasn't been often. I also tend to have silly rules for myself, such as that no two characters on the same server are allowed to sport the same hairstyle. Everyone must be unique! I would probably be in trouble if there weren't so many species that have no hair (Twi'lek, Togruta, Rattataki) or whose ladies at least look pretty good with a bald head (Zabrak, Cathar). Bioware's lack of skill when it comes to designing appealing hairdos certainly turns this self-imposed limitation into a challenge sometimes. You see this in some of their other games too: lots of hairstyles that give off the impression that the artist doesn't actually know how women like to wear their hair, and which look more as if someone just gave them a list of checkboxes in an attempt to come up with some variety: ponytail, short bob, bun, um... short style with a random braid somewhere? At some point however, someone up top seemed to say: To hell with worrying about clipping and physics, if people want to buy long hair, let them! So we got "the Barbie", which is sort of the opposite of what they did with lekku... no physics, it clips like crazy and moves about as gracefully in the wind as a hard hat, but who cares? People bought it anyway, and based on how many female characters I see sporting it on the fleet and in screenshots, it's certainly popular. A Shintar that must never be. 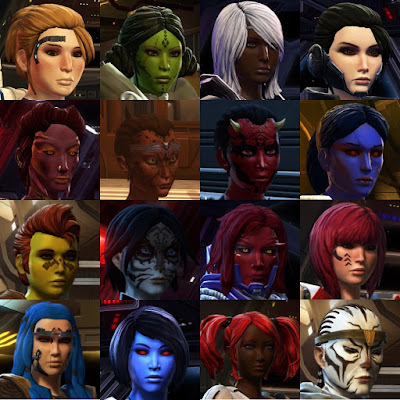 Now their latest coup has been to add some hairstyles that had previously been reserved exclusively for some important NPCs: "the Shae", "the Lana", "the Senya". I kind of wish they didn't continue to go down that road. It's not strictly against my imaginary rules, but it certainly doesn't help with feeling unique when I'm bound to eventually run into an important character that will sport the exact same hairdo as me. Plus I think the Senya bun is just an uglier variation of other buns already in game. ... but of course I still bought them! You never know. I can't keep creating Twi'leks forever and at some point I'm going to run out of available hair options that I find tolerable... unless they add more of course. Which is why new hair bundles will continue to be one of those things that I'll always pick up on day one. As I've always said my biggest issue with female hairstyles is that a good number of them are too fancy for the world in which the characters inhabit, particularly if their everyday job involved being on battlefields. Yes, sure, a fancy hairdo suits a ballroom, but would be absolutely ruined within an hour during a battle and definitely wouldn't keep form under a helmet. Not many of the base-game styles thus seem at all 'practical' to me, which is why until recently several of my characters used either the Jaxo-cut or the Shaggy-bun. Neither hair looks like it takes a lot of work to maintain, and thus can more 'easily' be ruined than a more tightly-woven style. I definitely seem to suffer from both aspects of caring about a character's look which you've described. I find now that I can't really connect to a character unless it looks 'right' from the off, but if something new emerges which I believe should theoretically help to 'perfect' that look even further, then that's something worth investigating even if it doesn't work out in-actuality. As an example of this last point, all three of my most recent Hunters have been clones of each other, just because I don't think I've ever created a better look for a Hunter, and I doubt I ever will. It also meant that I immediately worked out her personality and backstory just from her appearance alone, which is something that normally takes weeks or even months for me to do and often requires time to work out their ideal outfit(s) (which again happened fairly instantaneously). "... but of course I still bought them!" I buy the new hairstyles too. Not directly, but rather via the GTN. Most likely i'll never use them, because i play almost exclusively male chars. But... you never know! A well placed "space-barbie"-Tank in MM-FPs with next to no clothes always makes me cringe. 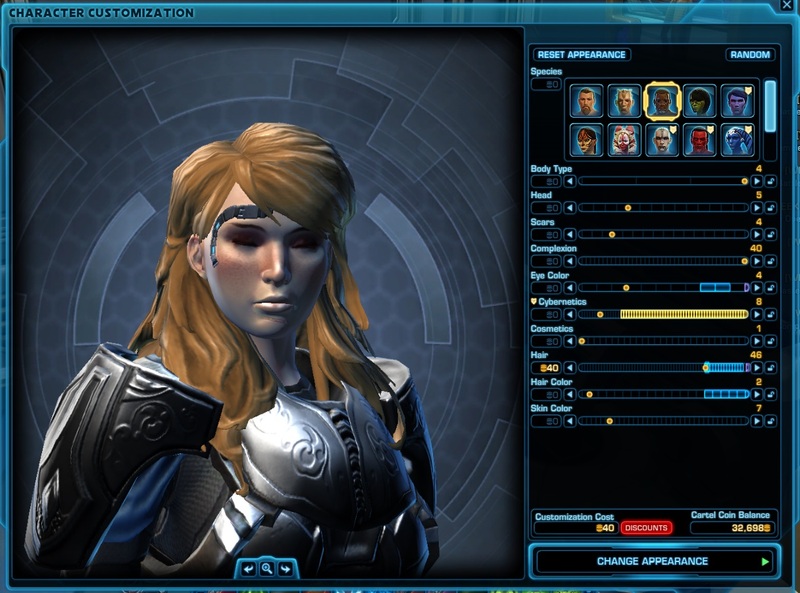 I admit, that my male smuggler put "his" Risha in the Social II Gear "Slave Girl Set". But i'm ashamed and i pay attention to send her away, every time i'm on fleet. The only time i ever spend CCs to change an appereance was with my "Pugette"-Style Jedi Knight. This hairstyle is just ridiculous. But the hairstyle was new, and i thought "if you buy it, you have to use it". So the next best character, which i created "had to" use this hairstyle. Big mistake. But as i said....every new hairstyle they throw at me, i'll buy them. The thing that annoys me the most about the non-vanilla hairstyles is that they color differently. Black especially looks distinctly not black on the new styles. That really annoys me as well! Especially on certain aliens the colours seem of. On my mirialan shadow all colours seem 'washed'. I stuck to dark grey there, although it doesn't make any sense for her (she's supposed to be young...). I generally try to use a different hairstyle for each of my characters as well. My commando and shadow are the exception. They're both mirialans and supposed to be related (my mando is the mother of my shadow). I always thought it's kinda cute that they wear their hair the same way.